ODM Publishing appointed Moove Agency to redesign and develop the new InvestmentEurope.net website.. The new website needed to run on WordPress, be fully responsive, provide event management, lead generation functionality and advanced ad management. 6 months. We delivered the project within a six-month time frame in order for the site to be ready for our client's big launch campaign. Are you too worried about your deadlines? Give us a call! Investment Europe is an established brand targeting fund selectors and investment professionals across the Continent. This is a disparate audience by geography and we wanted to create a website that would bring the users together to generate a real sense of community. Our readers are busy and the site needs to truly deliver in terms of content and functionality. We held a beauty parade of web designers but it was Moove who really stood out as understanding what we needed. They have approached the task with passion and professionalism. The new Investment Europe website is fantastic and we are confident this will soon become ‘the go to place for the fund selector community’ thanks to Moove’s energy and expertise. InvestmentEurope is the leading brand for fund selectors and investment professionals across Europe. It provides in-depth market news and analysis, a monthly publication, both print and digital, and a portfolio of conferences and events, both locally and on a pan-European basis. InvestmentEurope also holds the prestigious Fund Manager of the Year Awards to recognise excellence in fund management. At Moove, we start our website development process with a stage called Wireframing/Prototyping. We want to have productive and insightful discussions with our clients about the content, structure of pages and calls to action. Interactive prototypes help us achieve this with amazing clarity and effectiveness. We can suggest the structure of the content based on our experience of building websites for more than 10 years. Our clients tell us what they have learnt about their target audience, website visitors and their company strengths. Together we create a skeleton of a website that will ensure we have everything covered right from the start. We worked like little soldiers to get a consistent experience for every possible device. Users can register on the website to gain access to advanced features such as articles under a paywall, subscription to a print magazine, whitepaper downloads, access to digital magazines and more. Articles can be marked as 'Paid subscribers access only', which means they can be accessed only if a user actively subscribes to the site. If articles are under a registration wall, Google won’t be able to access them and index them. That’s bad news for SEO. Visitors from Google News also aren’t generally keen on landing on a page that requires them to register to view an article. They have better things to do. That’s why we implemented ‘Google First Click Free’. With this, the first article seen by a Google News user doesn't need a subscription. Any further clicks on the article page will prompt the user to log in or subscribe to the news site. Every registered user gets a profile account created in the CMS. It’s up to CMS administrators to choose the expiry of paid subscriptions. They can also see all of the data captured about the user as they interact with the site – when they downloaded a whitepaper, presentation slides from events or read the digital magazine. The website records all the answers, giving a full record of a user. A user might answer three questions for Whitepaper 1, five for Whitepaper 2 and so on. Over time, we record answers for all eight questions, giving you material for some pretty powerful marketing campaigns. This means that the site administrators can create as many event microsites as they like without any need for extra support from us. Our clients can be independent, produce new microsites and have flexibility, at no extra cost. A home-page slider comes with a real-time search mechanism to help administrators find and select articles they wish to appear in the slider. Each slide represents a specific category, giving clients the power to showcase multiple articles. The old website was jam-packed with articles dating back several years. Manually uploading it all would have taken us until Christmas. Luckily, we have a few technical skills. Working alongside the client, our development teams mapped categories from old to new and then created a custom script to import raw xml data into the new WordPress system. If you think that’s easy… the client also wanted to import images but not all images as some were protected by specific copyrights. Each image that was to be excluded was tagged and then removed from the import. The website serves ads using Google’s DoubleClick for Publishers for ads trafficking. We implemented advanced tools for increased page views and ads views, such as ads refreshing on every click of a photo in photo galleries. We introduced social media integration and encouraged sharing by the design and positioning of sharing elements. Meanwhile, we added Google Plus Authorship in posts to help build an identity for contributors. 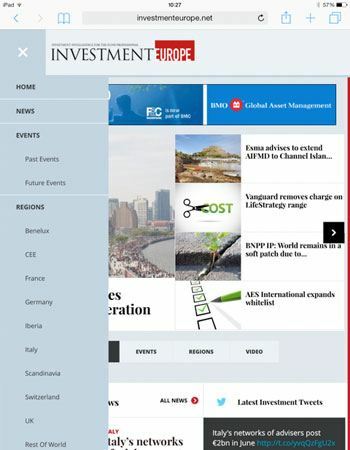 Marketing is a big part of our clients’ websites and we introduced a picture galleries feature to enable InvestmentEurope to showcase and promote their events across the website. We’re big on security at Moove, protecting against standard and known hacker threats. We also monitor activity on InvestmentEurope’s servers to ensure the site stays safe and healthy. Super-fast speed and load times are better for SEO rankings and users, so we optimise our websites for the highest-possible speed-loading score. Since the website launched, we’ve expanded the paywall registration system. It now includes features such as photography-competition submission, download of speaker presentations, download of digital versions of print magazines – and much more.